Staining antlers with potassium permanganate allows you to color and preserve the antlers of a deer, elk or moose before mounting them or using them for some other purpose. 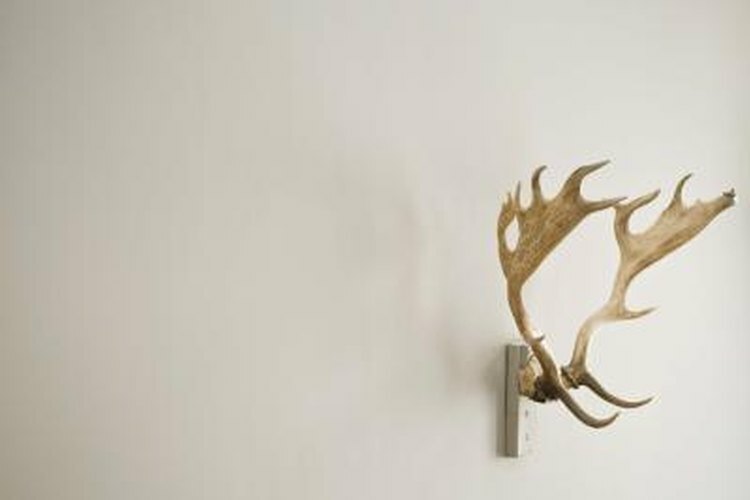 Carvings in antlers can also be stained with potassium permanganate to give them the rich brown color associated with preserved antlers. Potassium permanganate is a chemical that only adults should use, unless the children are old enough to be responsible and are closely supervised while using it. Although the diluted potassium permanganate used in dyeing antlers is less dangerous, do not handle it without proper protective gear. Prepare your antlers for staining by scraping the velvet off of them, if necessary. Put on rubber gloves and safety goggles before working with potassium permanganate. Mix 1/2 teaspoon of potassium permanganate per 1 1/2 cups of water. Fill a bucket or bowl with as much of the mixture as you need to cover your antlers. The solution will be a deep purple once mixed, but it will stain your antlers brown. Dip your antlers in the solution until they are submerged. Leave them there for five minutes and remove them. Examine the antlers to ensure that the solution coated them evenly. Repair any imperfections in the coat of potassium permanganate. Dip a cloth in the solution and go over areas that did not receive enough of the solution. Wipe the solution off of areas of the antlers that have too much of the solution on them. Allow the antlers to dry overnight before re-examining the potassium permanganate stain. Apply a second, even coat of potassium permanganate with a paintbrush or cloth if necessary. Allow the antlers to dry completely. Wipe the antlers with a soft cloth to polish them.